Dad’s Army. Those words conjure up images of cosy Saturday afternoon repeats, sitting back and giggling in my grandmother’s arms many years ago. Excuse me if this review seems a little biased, but this show is my comfort blanket. Some may think there is no need to pick up this release; episodes are constantly repeated as schedule filer for BBC1 and of course UKGold. While these repeats are welcome, of course, they have led to certain episodes being overexposed. The Deadly Attachment is a prime example: “Don’t tell him, Pike” is a scene that has seen viewing after viewing after viewing. The black and white episodes are rarely seen, and do not suffer from this over-familiarity. In fact they contain many noticeable little things which this viewer had completely forgotten about. 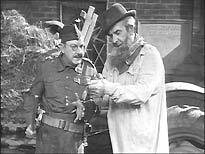 The aforementioned Deadly Attachment may be known as the episode where our heroes get to grips with the Nazi’s but few remember that they had already confronted the enemy in series one’s The Enemy Within The Gates. Many people will have pondered what might have happened to the characters after the war, but probably don’t realise that the answer is shown in the first scene of the first episode. The entire series is one long flashback! 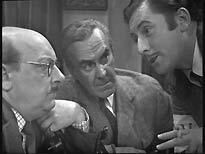 What about the fleeting appearance of John Ringham, as Bracewell, in the first episode? 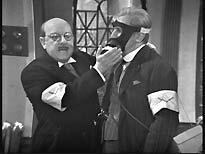 Bracewell was intended to be a series regular, but was dropped by Croft and Perry after the first episode. 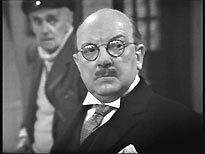 Do you remember Jones’ even more decrepit father, who crops up in Museum Piece? This was evidently to become a running joke (he’s mentioned again in the final episode of the first season, Shooting Pains, but was never seen again). There are nuggets of information like these to discover scattered throughout the nine episodes on this disc. Then there is the device of beginning each episode with a Movietone Newsreel-style clip, charting the platoon’s progress. These were dropped after the first series, perhaps because they were expensive to mount. The picture quality is, in a word, fantastic! It is actually surprising in some respects to see such a low key release from the BBC receive special treatment. The Film recordings of these series one and series two episodes have been polished up and VidFIREd to restore that magical live feel. There are some scenes when the process doesn’t work quite so well, and the episodes take on that filmic look again, but generally the image quality is surprisingly high. It’s a shame that some of the other recent archive comedy titles weren’t given the same treatment. 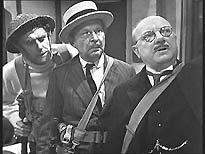 It’s almost heartbreaking to think that the episodes on the recent Hancock’s Half Hour disc might have looked as good as these Dad’s Army episodes, if they’d had the VidFIRE process applied to them. The improvements are particularly noticeable on the opening and closing title sequences, which have been remade from the best possible source by the looks of things. This ensures each instalment kicks off with the best possible introduction. The Bit rates for the episodes average out to 5.58Mb/s, at worst hitting about 4Mb/s and, at best, about 7Mb/s. The bit-rates for the extras vary wildly from about 4Mb/s to a whopping 8Mb/s. Sound does not seem to have gone through as much restoration but remains intelligible. There’s a flaw during Operation Kilt in which the audio level suddenly drops; this seems to be a problem with the DVD authoring as opposed to a fault in the original print as the drop is not present in the version broadcast recently by BBC. There are also problems with the beginning of Sergeant Wilson’s Little Secret, where the audio is duplicated across all three front speakers, even in Pro-Logic mode. This is a minor flaw that will only affect viewers with home cinema setups, and will probably only be evident if your speakers aren’t well-matched. Each disk features a static menu with a loop of the familiar theme tune playing. Basics such as Episode Select and Scene Select are presented in sub-menus similar to those of the BBC’s Doctor Who releases. For a budget release the special features are rather special. 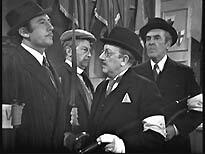 The centrepiece is Missing Believed Wiped; a documentary made for BBC2’s Dad’s Army night that chronicles the return of two missing series two episodes as well as providing an introduction to the archive TV hunt in general. 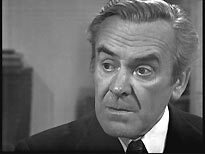 The documentary includes clips from a couple of other series that suffered extensive losses during the archive purges of the 70s, including clips from The Lion episode of Doctor Who, an episode of The Likely Lads, an 1962 Benny Hill show, featuring June Whitfield, and a 1966 comedy Playhouse called The Bishop Rides Again, featuring Derek Nimmo. 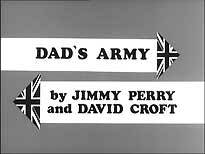 Another item of note here are the clips from the pilot episode of an American adaptation of Dad’s Army, titled The Rear Guard (a re-make of The Deadly Attachment). The clips, presented from what looks like a Umatic or VHS recording, are fascinating. Although the show looks terrible, they offer hope that we might see the whole episode on a future release. The documentary is presented in anamorphic 1.78:1 widescreen format: the archive clips it contains are windowboxed, in their correct 4:3 ratio. The disc also features “BBC Audio Recordings of the three missing Series Two episodes”. Some may be disappointed that these are radio episodes as opposed to off-air recordings of the television soundtracks. Nevertheless, they are very funny and provide an idea of how these missing gems may have played out. Each audio instalment is presented on a static background displaying a CD box set, and is neatly chaptered. The audio quality is very high, better, in fact, than the audio for the TV episodes. Next are the Easter Eggs, yes Easter Eggs! Drag your cursor across the following to reveal them! Highlight the Play All feature and press enter. As soon as the episode starts playing hit rewind. You will find the original VT countdown Clock from the studio recording on The Man and The Hour complete with the floor manager asking for quiet! Highlight the Play All feature. Press up. The Words Dad’s Army will now be highlighted. Press enter. This for me is the best feature on the disk; Raw film from the marches from the end titles of each episode and an extended version of the theme song. Joy! This is an essential release for anybody who loves British comedy. 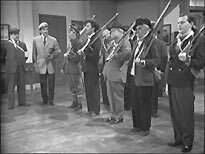 If you think Dad’s Army began with the colour episodes then this release is the perfect chance to reacquaint yourself with Walmington-on-Sea’s Home Guard.